Market leading technology with componentry that you’d expect to find on a much more expensive e-bike. Our bestselling e-bike features the new TranzX F15 front drive motor delivering a hi-torque quieter performance and now incorporating CanBus/Logix computer diagnostic capability which gives more efficient and accurate information for your EBCO service dealer and together with a larger 400wh battery will give more miles (range 30-50 miles) of enjoyable e-cycling add to this our new headstock comfort front suspension unit and you have a quality fully equipped e-bike that offers tremendous value for money for both the commuter and leisure cyclist. Our original UCL/R-30 won The Sunday Times ‘In Gear’ best buy award and was selected to feature on BBC’s the One Show electric bike feature. Available in Lowstep frame style (that makes getting on and off much easier) with a comfortable upright riding position. Sizes:-S.M. Finished in Matt Gunmetal. The answer to traffic congestion, stressful commutes or just enjoyable leisure cycling. Urban City Lowstep frame with Headstock Suspension Forks built in T6 high grade aluminium giving a stable and comfortable riding experience. 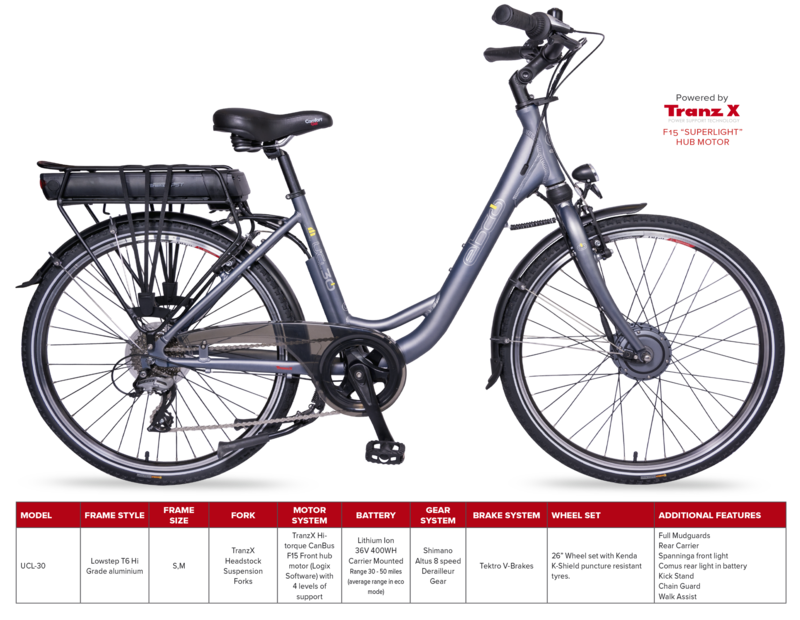 26″ wheels for lower step over riding position fitted with Kenda tyres featuring an Iron Cap puncture resistant K-Shield belt and reflective side walls. TranzX PST 250W 36V brushless high torque F15 front hub motor matched to an RPM sensor, precise motor controller and DP27 LCD display screen with 4 power support modes and walk assist function giving a smooth controllable riding experience. Lithium-ion 36V 11AH (400WH) battery which locks securely and is removable for charging (charger supplied). Shimano Altus 8 speed derailleur with Tourney Revo shifter for smooth and easy gear changes. Tektro V-brakes front and rear producing efficient and effective stopping power. Adjustable handlebar stem, comfort bars and ergo grips, EBCO comfort gel saddle, allowing fine tuning of your riding position and mudguards, chain guard and kick-stand to maximize rider enjoyment. Weight of bike including battery: 24Kg Approx. Display: TranzX DP-27, 4 power support modes, speed indicator, remaining battery indicator, light function and walk assist feature. Pedals: VP resin comfort pedals, 9/16\\\\\\\"
Weight of bike Inc. battery: 24kg approx.